We laugh when people talk about treating people in the real world like we do on Facebook. One such post begins, “every day I walk down the street and tell passers-by what I have eaten, how I feel at the moment, what I have done the night before, what I will do later and with whom.” The post continues with other things and ends by saying, “I already have four people following: two police officers, a private investigator and a psychiatrist.” Yes, we laugh, but what if we really did apply the same principles that we use on Facebook to the world outside? This conversation isn’t farfetched, but here are two strangers who have within moments of meeting each other talked about what they have eaten, how they feel, what they have done, and what they will do later. It ends with an affirmation (a like, if you will) for what one of the people has said. It isn’t that doing the things we do on Facebook would be so strange if we did them in the real world but we’ve isolated ourselves so much in the real world that we don’t give ourselves the opportunity to do these things. I find it interesting that people talk about what they would do if they “walked down the street.” It isn’t that people don’t do the things they do on Facebook, but people don’t “walk down the street.” Instead, they get in their cars and drive from one parking space to another. They see many cars, but few people. There is no communication between cars. Once people reach their destination they might talk to other people, but mostly they assume that other people don’t want to communicate with them. 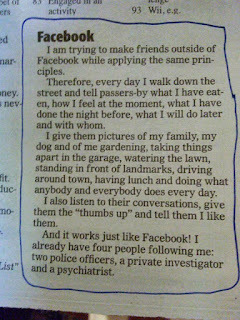 Then they get in their cars and drive home where they lock themselves inside and contemplate how unrealistic Facebook is. Imagine how different it would be if we would remove the shell. Imagine if we gave ourselves opportunities to talk to people, even if we just talked about eating at a favorite restaurant or at one that we hated. Imagine if we removed the glass bubble. Imagine knowing your neighbors by face if not by name. Imagine having a conversation with someone just because they happened to be standing or sitting near you. Imagine expecting this to happen every day. 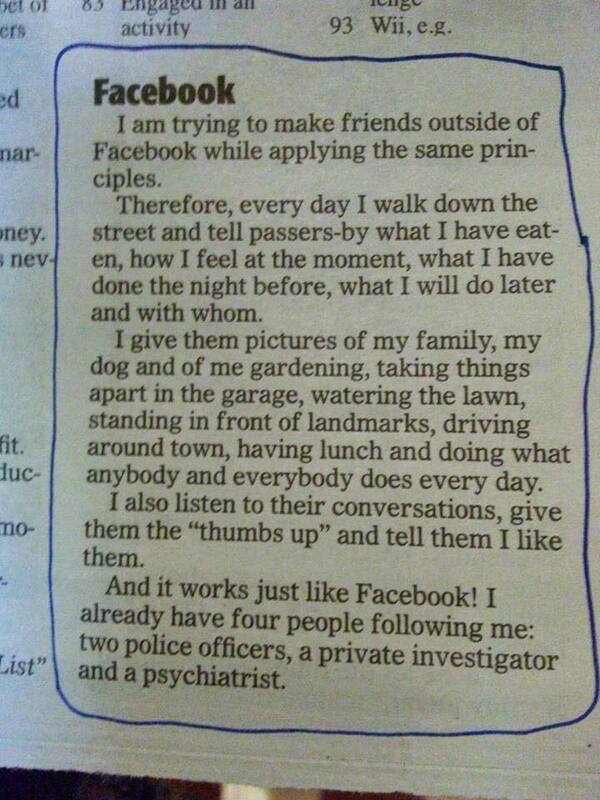 This is what we would really have if we applied the principles of Facebook to the real world.